Future New Home Site with a freshwater canal to the rear of this southwest exposure lot! 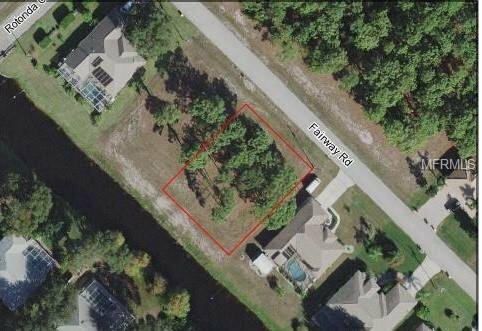 This beautiful building lot is in Rotonda West at the Pinehurst Subdivision and is a X flood zone with an elevation of 11" per the seller. The property has water, cable, telephone and sewer available. In 2016 this lot was cleared of the Brazilian Pepper per HOA mandate. You will not be disappointed with 99 holes of Golf to choose from, all within a few minutes from your front door. This golfing community also has 30+ miles of fresh water canals! Enjoy this deed restricted community with parks, a walking and bike trail called the Cape Haze Pioneer Trail which runs along the eastern part of the community. This property is located approximately 9 miles to the Englewood Beaches. This area of Southwest Florida is best known for its fishing, boating and golfing and our relaxing gulf beaches minutes away. Listing courtesy of KELLER WILLIAMS REALTY GOLD. Selling Office: PARADISE EXCLUSIVE INC.